A city can be made at many different scales. A city can be a room, or an ensemble of interior objects, furniture and fragments, each playing its specific role and co-existing to create a harmonious whole. An interior can be a miniature testing ground for architectural ideas, forms and materials. A bookshelf, a table, a storage unit can be an idea for a facade, a library, an infrastructure. 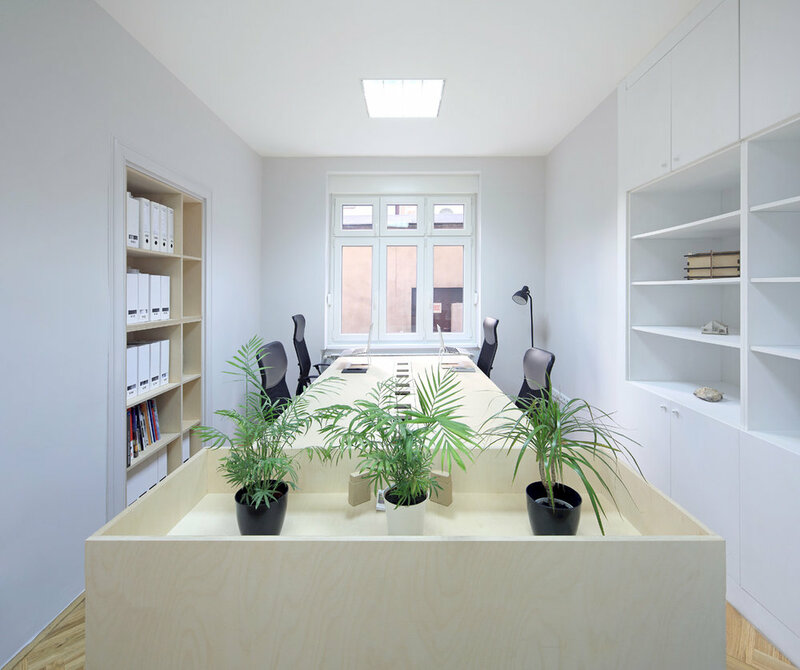 Situated in the heart of Marijn Dvor, this is a small, simple, modest and low budget refurbishment of an Austro-hungarian period lower ground floor apartment, which has been transformed for use as an architecture studio. The project is grounded in a desire to create calming, silent and intimate interior spaces, which have an aesthetic and functional coherence. Sensitive and precise interior interventions include well crafted lightweight birch plywood and steel furniture insertions; shelving, furniture and storage have been inserted into the existing nooks and crannies to make a harmonious whole. Transforming the apartment and the use of the space, while respecting the overall historic proportions and features of the space. The resulting interior environment offers an alternative atmosphere to the recently commercialised centre of Marijn Dvor located on its doorstep. A part of the city, which is ‘bloating’ with excessive form, consumption, noise and visual over-stimulation, with little respect for its historic heritage. 1. The Library; transforms the formerly under utilised entrance hall into a shared waiting area and library with a floor to ceiling birch plywood shelving unit with integrated seating, providing a threshold space between the outside and inside, allowing visitors a moment of calm before continuing further. 2. The Workstation; transforms the larger office space into a productive and communal workstation for 4 people, with in-built furniture for model making, printing and storage spaces, which makes efficient use of the small floor area and gives warmth to the space with creative and well made details. 3. The Forum; transforms the dining room into a shared area for meetings and presentations, which includes a white cork wall panel to assist the collaborative process of design and presentations with clients and collaborators. Further phases of the scheme will be completed at a later stage, which include upgrading the small kitchenette and the small lawyers office. The birch plywood furniture insertions play with a hierarchy of proportions, based on the golden section, which along with providing functional purpose required to make efficient use of a small area, give an aesthetically fluent language and complement the play of proportions between different sized original doorways. These features, coupled with the continuous surface of newly painted light warm-grey walls, doors, architraves and vertical surfaces, create a flow of spaces which give a feeling of generosity and openness. The decision to paint the doors and architraves to match the walls, democratises the space and hierarchy of the original architectural features, allowing the material language of the new inserted furniture objects to be distinguishable, while co-existing harmoniously within the continuous grey surface of the historic space. Like an archipelago of acupunctures in a sea of grey. Creating a new contemporary state without removing the original features of the space. 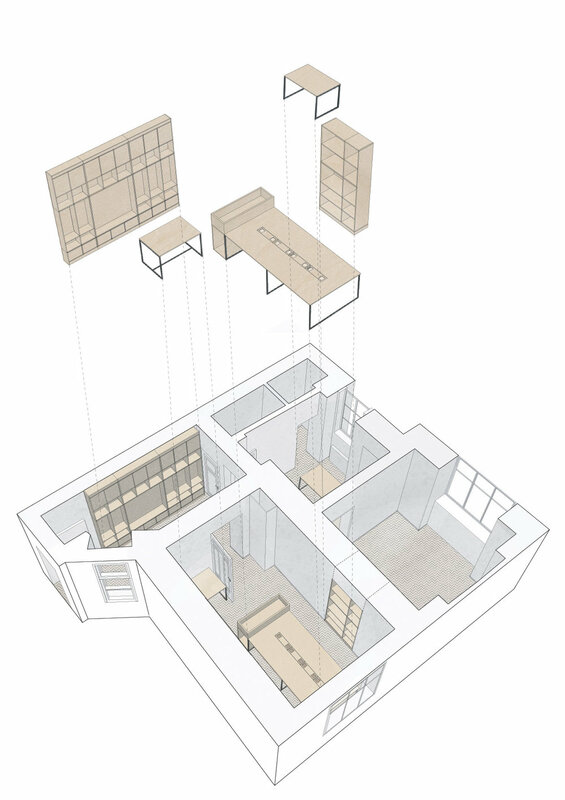 One key detailed intervention, which has transformed the use of the apartment; is separating the new architecture office and the lawyers office with the insertion of shelving units with sound insulation between, inside the 80cm deep original doorway between the two rooms. This provides each separate office privacy and a deep 35cm recess, either side of the old door alcove, which has been used for shelving. This small, low budget and incremental approach to the project aims to set a precedent of similar projects. Whereby rather than completely filling a space with ‘stuff’ and decoration, a light-touch and minimal approach can prevail, in which the objects in themselves, may be few, but have a strong presence, material language, functionality and recognisable aesthetic, allowing them to drive the atmosphere of the space. The project had to be delivered on a low budget. Projekt V Arhitektura chose to use natural birch plywood and black steel finish as the main materials, which complimented the existing solid oak herringbone floor. Projekt V worked directly and closely with skilled craftspeople to make the furniture objects. This approach to materiality and craftsmanship is key to Projekt V’s work; where every project gives opportunity to explore different locally available natural, raw and honest materials, along with working closely with craftspeople to produce carefully crafted products and to promote the use of natural materials and wood in BiH. In the hope that eventually as demand grows, there will be more opportunity for the growth of the local material industry, rather than the society relying heavily on imports as is now predominantly the case.